This guide is designed to give you a basic formula to select better Shortboards tailored to your individual needs. These simple steps will save you time & money by eliminating unnecessary mistakes. Shortboards are highly sensitive performance boards that require the rider to consider every detail. Getting these steps right is essential to giving yourself the best chance of nailing that magic surfboard. The ultimate goal is to come in from every surf satisfied & happy. Choosing great surfboards becomes a fun process when you have a basic strategy & you will get better surfboards. That’s what this process is all about, getting you on better surfboards & having more fun. Surfers today have plenty of board options available, from selecting the shaper/brand to their many surfboard models. Choosing the right board can become frustrating & difficult. Our steps are exactly what the top shapers & their teams do when designing & refining their surfboards. We have access to all their knowledge & skill. Elite shapers are identifying & integrating their knowledge into surfboard models for everyday surfers to enjoy. An exciting time to be a surfer when you know what you’re looking for. 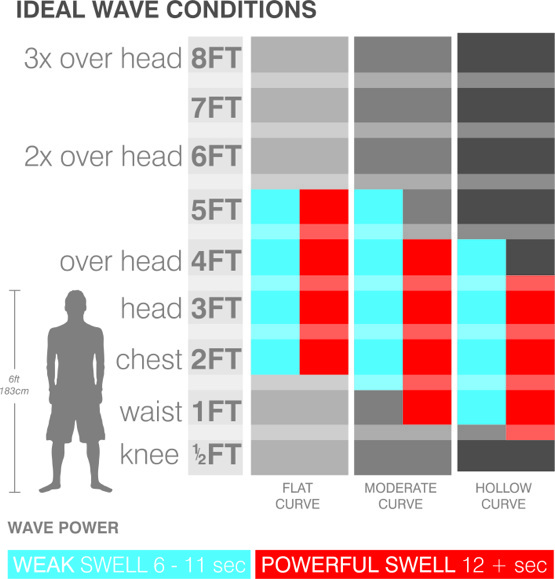 Ideal volume is a figure unique to each individual that can be easily applied when selecting a new surfboard. Use your ideal volume in collaboration with these other steps for the best results. More Info: Ideal volume is an in-depth figure generated by each surfer’s individual weight, ability, age, fitness & personal preference. In my opinion, Ideal Volume is the most important variable to consider when choosing a surfboard size. Note: Have a close look at what the Pro surfers are riding & you will see their quiver of boards are very similar in volume, with small variances depending on the board type. Identify what waves you intend to surf & choose a surfboard model that matches these wave conditions. More Info: Every board model is designed for specific wave conditions. There is no surfboard model that excels in all wave conditions better than the rest. This is because each design element will perform better in certain wave conditions than others. Example: A wide tail area will perform better in weaker wave conditions compared to a narrow tail area which will perform better in powerful conditions. This is what separates elite shaper from the rest, they know how to balance each design element to produce the best results for the intended wave conditions. These days there is a board model for every condition possible, which gives surfers the ability to select boards specific to the wave conditions they intend to surf. Note: Surf Shop Australia has labelled each board model into specific surfboard types, to easily identify it’s purpose. There are surfboard charts illustrating each board models Ideal Wave Conditions. You can read about the different surfboard types click here Surfboard Types Shortboards – Longboards – Beginner Boards. The Ideal Wave Conditions is assigned to the various surfboard types & this information can be found for each surfboard model within the product overview section, descriptions (tab). Identify your surfing skill level & make sure that particular surfboard model is recommended for your ability. More Info: Each board model has a certain amount of performance & stability. These two performance characteristics are very important. Board models with high-performance characteristics will have less stability & vice versa. Performance is the surfboards ability to handle & perform critical manoeuvres (Very Sensitive, Un-Forgiving, Difficult to ride). Stability is the surfboard’s capacity to handle a the surfer’s movements & position on the surfboard. (Less Sensitive, More forgiving, Easier to ride). Example: Hi Performance Surfboards are very unstable & require a high level of skill to control. The ideal situation is where your surfboard has enough performance to push your surfing & enough stability to keep you from falling. Note: You can find the recommended surfing level for each surfboard model in the description (tab) within the surfboard overview section. This process can be simple or as complicated as you want. It’s a great starting point to developing your own formula. Use it from start to finish or adapt it with your own ideas & experiences. There are so many factors involved with surfboard design that it can become very overwhelming. Using the process above is a way of organising & simplifying the board buying process. The most important factors are considered here & the rest will come from your experience over time. I use this process every time I buy a board; it allows me to jump on different shapers boards & models without losing that familiar feel. My strike rate of good boards a lot better. surfing is a lot more exciting when you know your board works. Again this is just a basic process that takes out the unnecessary mistakes that occur when buying surfboards. There are plenty of other variables we cannot control so this basic process will give you a head start. Note: I have refined my volume over time by trying different volumes & have ended up with this Volume Range. I’m on the low volume side for an advance + surfer of this weight & fitness but I prefer the increased performance a lower volume board gives me. And I prefer powerful hollow waves, where these lower volume surfboards provide control. I also have chicken legs so a lower volume surfboard is easier to bury into the wave face & manhandle the board. The drawbacks are reduced paddle power & when I’m not feeling it, unsteady on my feet these surfboards aren’t very forgiving (unstable). My small wave surfboards are beefed up so they make life easier in softer surf conditions.